* rpt from * to * to end, working a ss into last dc. Turn. Second Row - 1ch, 1dc into each tr and ss to end. Turn. Earflaps x 2 - With RS facing and working from seam miss 13 stitches, rejoin yarn to 14th stitch with ss, 1ch, 1dc into base of 1ch, 1dc into next 7 stitches. Turn. Continue on these stitches for a further 4 rows. Turn. 2dc together to make a point. Fasten off. Miss 27 stitches and rpt same as for first earflap. Starting at back seam, and with RS facing, work 2 rows in dc evenly all around helmet including earflaps, working 3dc into points and turning at the end of each row. Fasten off. 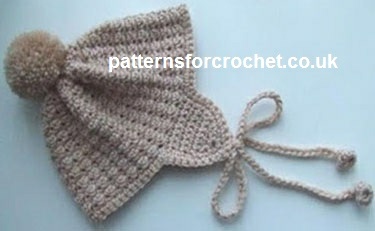 of yarn to gather into a bobble and attach them to ties.